You’ve heard the term before: The Internet of Things (IoT). But what does this buzzword really mean? And what are the ramifications of the IoT on the business world? In this interview, Lerner College assistant professor of operations management Junbo Son explains how the IoT could revolutionize the way we collect and analyze business data. In simple terms, what is the Internet of Things? This is not an easy question because of the interdisciplinary nature of the IoT. Experts in various fields may have their own definitions on the IoT. In my opinion, the IoT is a comprehensive set of tangible infrastructure (sensors, wireless networks and data storage/management) and relevant techniques or methodologies that enable effective data analytics and system control. Some people may think that the IoT is just high-tech expansive electronics that communicate with each other. However, what we should focus on is the fact that we obtain data as a by-product of this information flow (communication). In other words, the IoT turns everything into data; hence, it provides unprecedented data availability that can be used for various practical purposes. How do you work with the Internet of Things? As I pointed out, the IoT has various aspects and, roughly, we can classify them into two folds: infrastructure and analytics techniques. My research focuses on the data analytics for the IoT-enabled smart systems. For example, over the last couple years, I have proposed a series of analytics methods for a smart asthma management program. In this program, patients diagnosed with asthma carry a specially designed rescue inhaler. This inhaler can be viewed as the IoT because it collects the time and location the rescue inhaler uses, and it enables wireless communication among patients, practitioners and the system administrator. Based on the individual patient’s rescue inhaler usage profile, we can diagnose the level of asthma control, predict the imminent risks and alert the patient if necessary. This diagnosis-prognosis-control paradigm specially tailored for the IoT-enabled environment is my primary research topic. My other research on the IoT focuses on various fields outside of healthcare, such as vehicle health management (e.g. General Motors’ OnStar® system). It is true that the IoT is realized by an array of advancements in sensory devices, wireless network, and information technology. Of course, we should keep enhancing the hardware that composes the IoT. However, the real magic is somewhere else: The IoT brings significant opportunity because it turns everything into data. I don’t even need to mention the buzzword “Big Data” here to make my point because, nowadays, everybody understands how valuable data is. The information we can obtain based on the data collected by IoT-enabled systems allows us to operate/control the system in an optimal way. Unfortunately, this unprecedented data availability comes with new challenges. I have been working closely with Professor Shiyu Zhou at the University of Wisconsin-Madison, who is affiliated with the UW-Madison IoT Lab. During that work, I was able to observe those challenges in analyzing real-world IoT data. For example, the data collected from IoT often have missing or invalid entries, severe heterogeneity, and inconsistency due to various data-acquiring sources. How to massage the messy raw data provided by the IoT so that we can draw meaningful insights is not a trivial task. Therefore, the crucial fact about performing data analytics on the IoT is the context. Context really matters in IoT research, and that is why all IoT research should be interdisciplinary. What are your future plans or ideas related to this work? I plan to keep working on the healthcare applications that take advantage of the IoT and wearable devices. This field provides a lot of exciting research opportunities, especially for effective chronic disease management such as diabetes, hypertension and asthma. 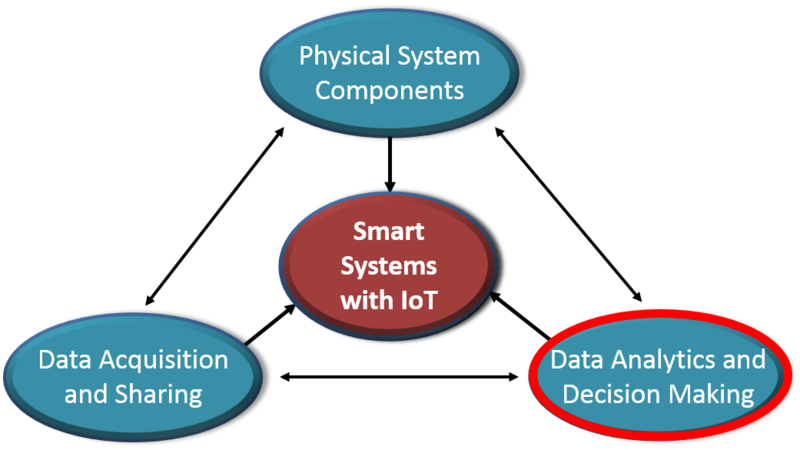 My primary research focus is and will continue to be data analytics and decision making for solving practical problems in the real world IoT applications. At the same time, I will continue to collaborate with experts in various engineering domains who understand the physical component of the IoT infrastructure, and people from the information systems field who understand how data acquisition and sharing work in IoT systems.